Summer is finally here and once again it’s time to head up north and enjoy our PURE MICHIGAN! You’ve seen Jill’s adorable cottage, now it’s time to show you the Deimling’s summer home. 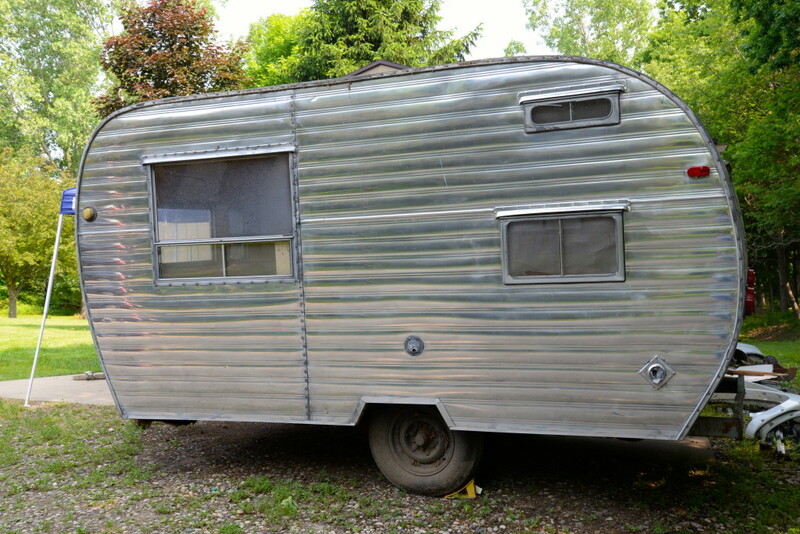 The story of our vintage camper project began approximately 3 years ago when I went to a local auction to pick up furniture for the store and came home with this beauty. Brian and I have always been campers but our version of camping usually includes 5th wheel campers, diesel trucks and toy haulers. Now that our children have grown, we’ve decided to downsize into something a little cozier. With a family camping trip rapidly approaching, we realized we better get busy transforming it into something that would function for the two of us and was more our style. This is part one of our vintage #camperproject transformation. First things first, DEMO DAY! We gutted the entire thing to remove the old cabinets, benches and layers upon layers of various flooring. 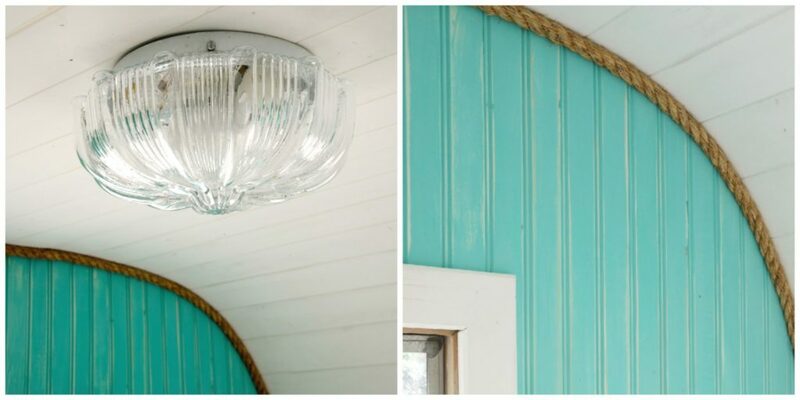 Next, we lined the walls with beadboard that we could paint and distress. 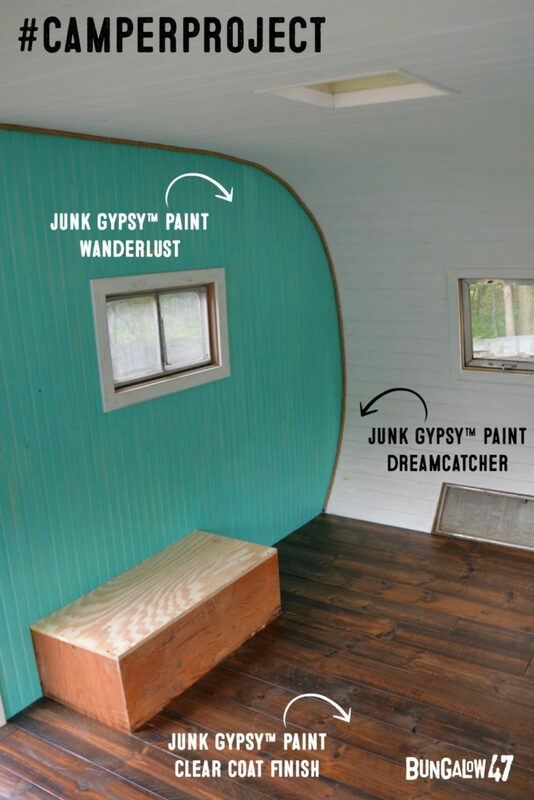 After conducting a quick Instagram poll of what color the walls should be painted, we decided on Junk Gypsy™ Paint Dreamcatcher (white) for the curved walls and ceiling and Junk Gypsy™ Paint Wanderlust (turquoise) for the opposite walls. We painted everything and distressed it with a fine grit sandpaper. Once the walls were done, we turned our attention to the floor. 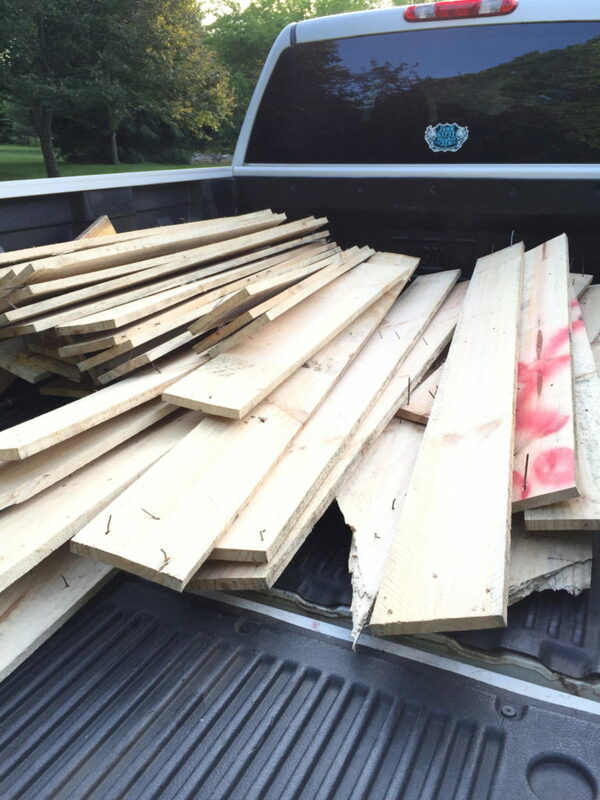 After shopping the selection at Home Depot we determined we needed a thicker floor (due to the uneven surface in the camper) and picked up a truck load of pallet wood. The price was right (free) but it did require a little more work to prep the boards. The boards were full of nails that needed to be pulled, was uneven and different thicknesses. We pulled the nails, put them through the planer and then ran them through the jointer giving them a more finished look. 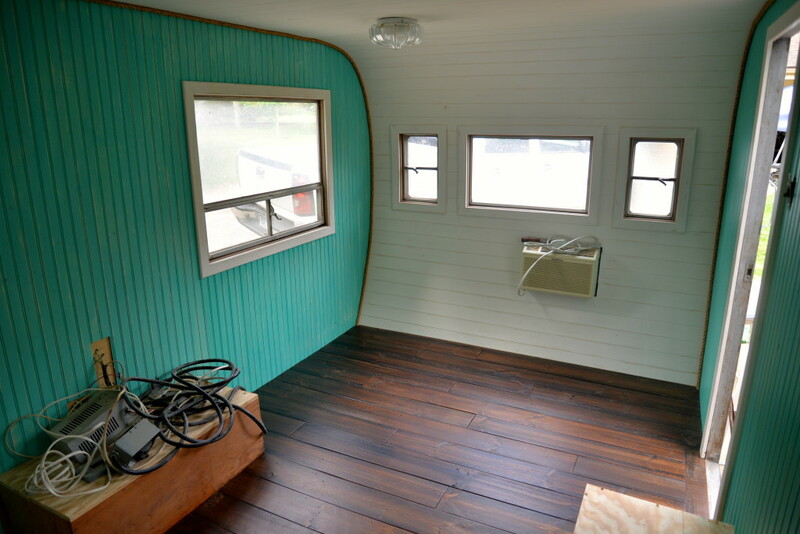 Once the floor was down, it was stained and finished with Junk Gypsy™ Clear Coat finish. We also added a few other little details to the shell remodel. 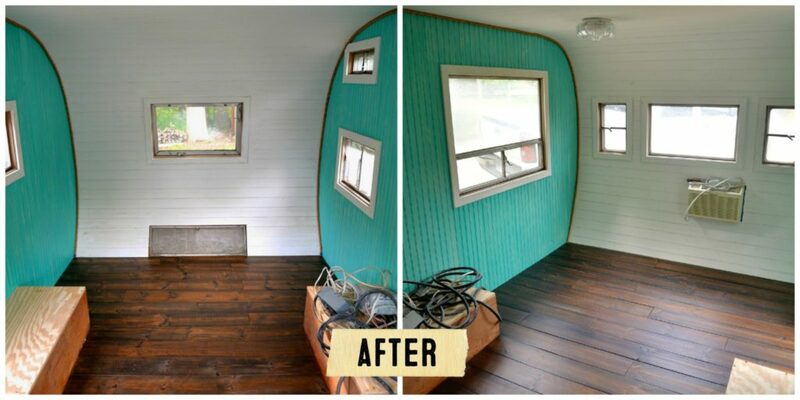 This adorable light fixture came from our local Habitat for Humanity store and the rope trim was a perfect solution for edging in the round contours of the camper. Now that the shell is done. 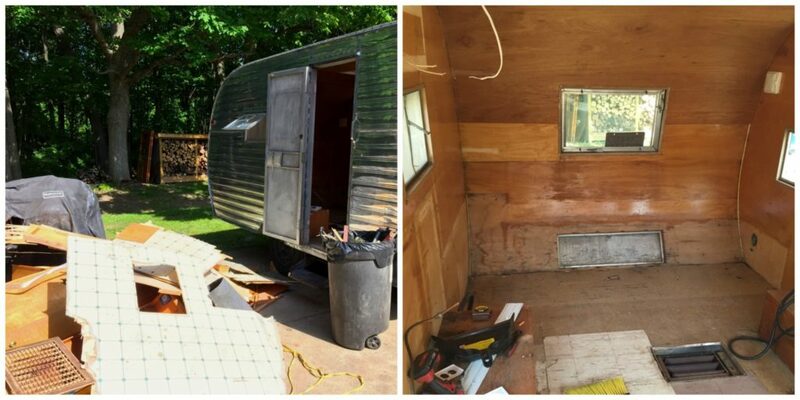 It’s time to add the bed, refrigerator and other decor to complete our camper project. Stay tuned for part two of #camperproject. 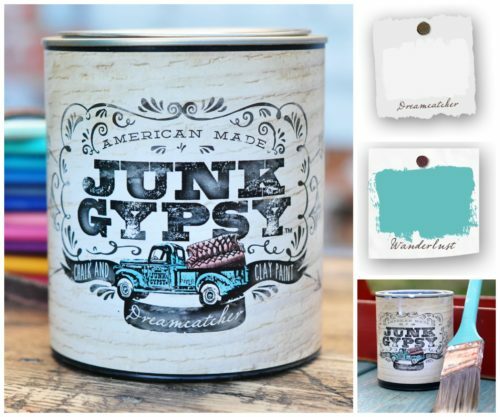 Products used during part one of our vintage camper project include Junk Gypsy™ Paint Dreamcatcher, Wanderlust and Junk Gypsy™ Paint Clear Coat finish. Awesome! Looking forward to seeing the finished product. I can’t believe you turned pallet wood into such a beautiful floor. I look forward to part 2 .
it’s a little dream of mine to do what you two are doing. This project is very cool. Love, Love, Love, the camper!!! I have always wanted an airstream, but this is just adorable……my husband is really nervous!!!! This could be our next project (like we need another one)!!! I can’t wait to see the progress!!!! What a great idea to use the rope to edge the contours!! Keep sending those great ideas!! I love this! It must feel rewarding after a lot of hard work. And I cannot wait for part two. 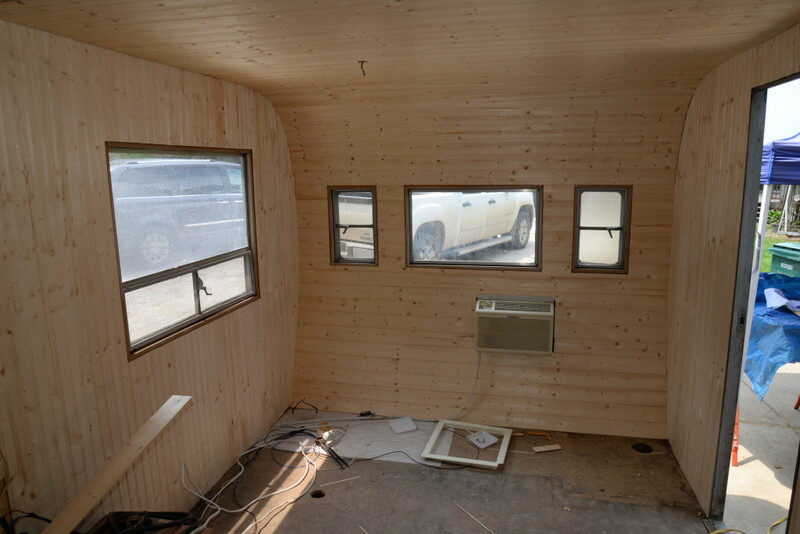 …we are renovating a trailer as well and stuck on figuring out what all to gut. Absolutely Love this!! We are currently restoring a 1960 Shasta so thank you for the great ideas! I think we will definitely put bead board on the walls/ceilings. I also love how your corners were a rope! That is awesome! This gives me inspiration for my own vintage camper! Was the outside always silver or did you paint it? Was there any water damage you had to deal with? Holly, So glad we could offer you some inspiration! The camper was always silver, just needed to be polished. There was no significant water damage to deal with. Thanks for following along with us! 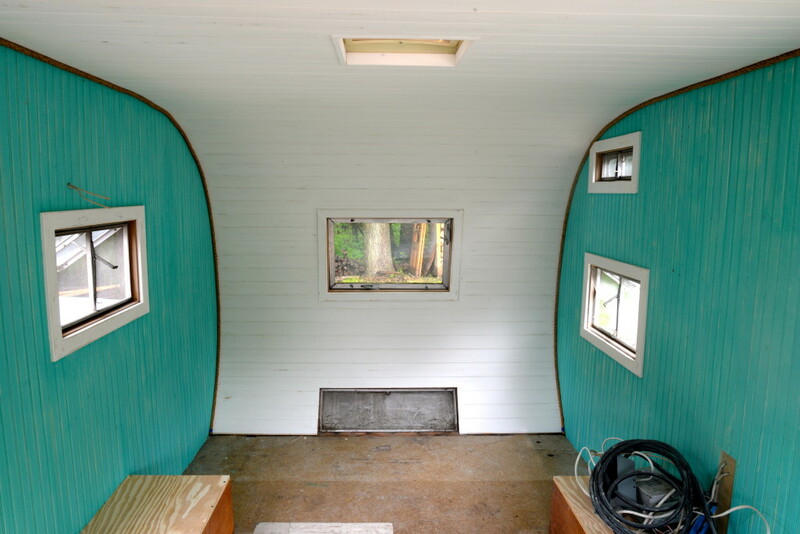 Can I ask what product you used on the rounded ends of the camper for wood? Also, did you go over existing paneling? The walls were paneled using bead board trimmed out with rope. The bead board was nailed to existing paneling. 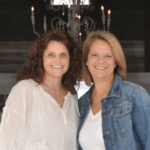 Can I use the before pic in an article I am writing. Would like to give you full credit and a link. I am having problems getting the paneling to bend at the curve. Do you have any suggestions? You can score the backside with a utility knife to get it to flex! The part 2 will be published on Thursday, October 27. Wait until you see it, it’s sooooo cute! We used pallet wood from over sized pallets. 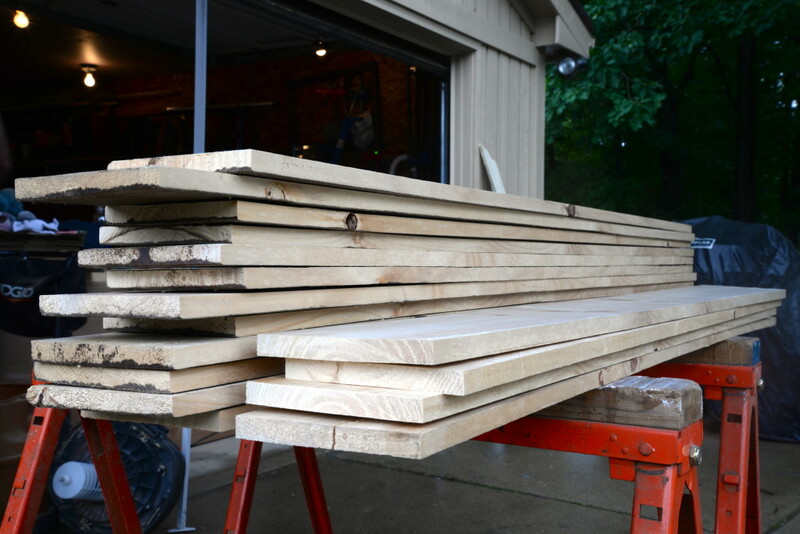 We cut them to length and put them through a planer to make sure they were the same thickness. We glued and nailed them to the subfloor of the camper. The boards were then stained with a minwax color and sealed using the Bungalow 47 Matte Finish product we carry. Good luck with your project. Tiny campers are the best!!! Hey guys, great project. Because my partner and me are renovating a caravan which also has an aluminum shell, I am wondering how you got yours so well polished. Any tips for us? Thanks for the great inspo!! 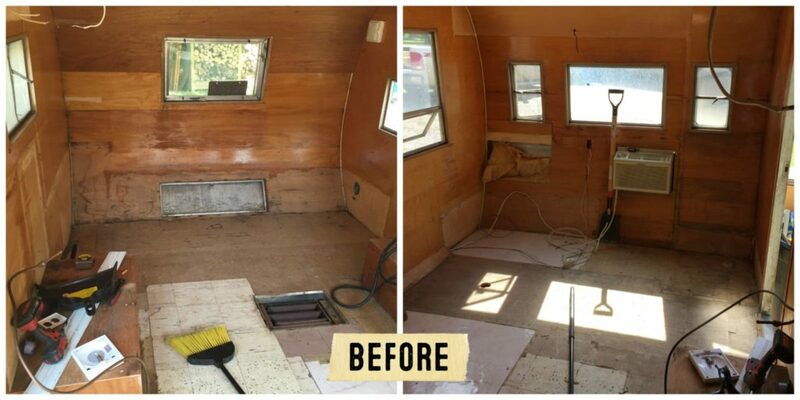 We are currently renovating an old caravan and are just getting to the part where we can add the trim. Any tips for how to stick the rope up?? Cheers, Christie & Tara ???? My husband and I are refinishing a 1967 Playmor camper about the size of yours. We’re just putting the last of the beadboard paneling up. I’d like to catalog our progress on Pinterest, but I haven’t figured out how to upload it yet. Hi. Great job I love the look. Did you use individual beadboard planks or larger like 4’x8′ boards? If you used the larger boards, how did you curve them round the curve of the camper. That looks awesome! It’s giving me hope that I can actually re-do one!